Have we not done this before? Brexit – we didn’t vote for this! Walk da Rock Step Count Challenge - get your year off to a flying start! We're sorry, but Shetland News isn't fully functional with . Head over to the update page for instructions on updating your browser for more security, improved speed and the best overall experience on this site. UPDATED at 7.40pm: SEVERAL police cars and ambulances rushed to Brae to attend a disturbance in the village on Monday afternoon. Two people are understood to have been taken to hospital following the incident, but neither is believed to have suffered life threatening injuries. A police spokesman confirmed that at least four police cars and two ambulances had left Lerwick at around 4.30pm to attend the scene. 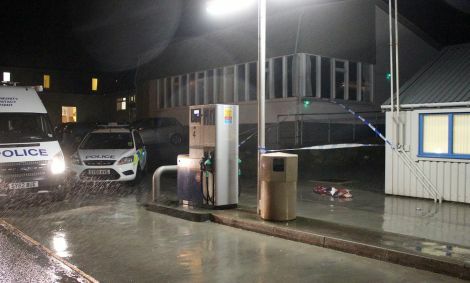 Eye witnesses have reported that an area between Brae Garage and the Northern Lights Bar has been cordoned off. Chief inspector Angus MacInnes confirmed there had been a “disturbance”, and he was aware that conflicting versions of what had happened were circulating on social media websites. MacInnes confirmed that police officers were “guarding” an area in Brae, while others were on patrol and making inquiries. Police also attended a single vehicle crash in the Staney Hill and Hoofields area of Lerwick. There were no injuries, two people have been taken into custody. It is understood officers are investigating whether the two incidents may be connected in some way. MacInnes appealed to anyone with information on either incident to contact Police by dialling 101 or calling Crimestoppers on 0800 555 111. If you come here regularly to get your local news, why not help us financially and sign up as a regular supporter? Choose how much you contribute, no commitment required, cancel anytime.